How was your Christmas? I hope you all had a brilliant one, I did! Christmas in my household is always quite a quiet affair, but that's just the way we like it! It's been a lovely few days at home and now I am looking forward to travelling to Stafford for New Years with lots of friends! Even though Christmas is reasonably quiet I love to get dressed up! Everyone in my house loves Christmas so we all get dressed up, have an epic dinner and spend the evening playing board games. I honestly can't think of a way I would rather spend the day. Just before Christmas Scarlett & Jo sent me one of their newest dresses and I thought it would be perfect for Christmas. 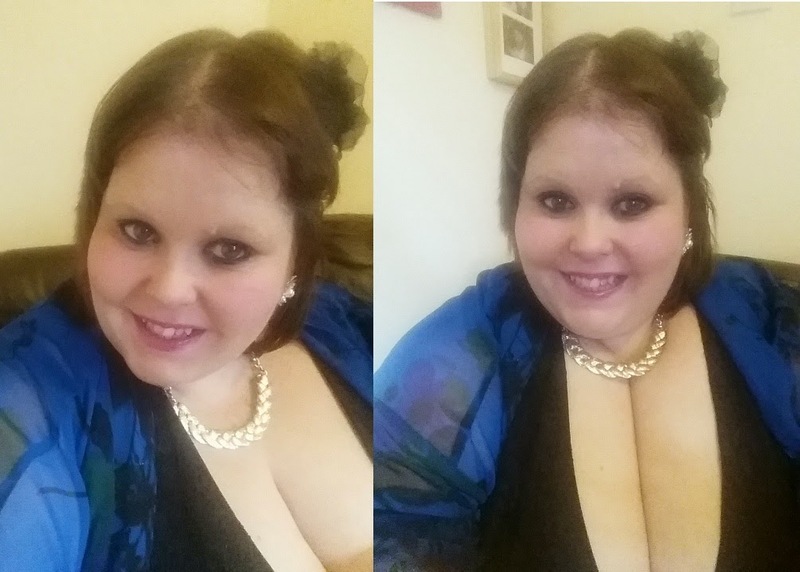 I love the blue colours in the kimono and knew it would be perfect to dress up with a bit of bling. 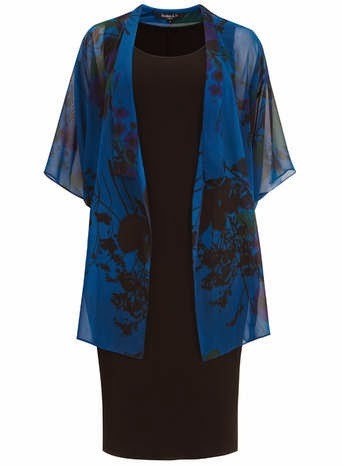 The Scarlett & Jo Multicoloured Floral Kimono With Black Dress is quite a grown up dress, but it;s lovely and I feel could be dressed in lots of different ways. The black dress underneath fits well too! As it was on the day I felt that a plain black dress underneath was a bit plain, so I actually teamed up the kimono with a black dress I picked up in the ASOS Curve sale a few days before.The dress itself is lovely but I wanted to dress it up a bit for Christmas - after all, if you can't dress up at Christmas when can you? One of the best things about the kimono dress from Scarlett & Jo is that although the kimono is attached, it is done so by poppers. This means that you can remove it and mix and match items. I love versatile pieces like this, so it's a definite plus point for me! Kimonos are nothing new, they have been around for a number of years. However this season that are as fashionistas would say 'bang on trend'. I am so pleased that so many plus size retailers are taking this on board and providing plenty of choice! 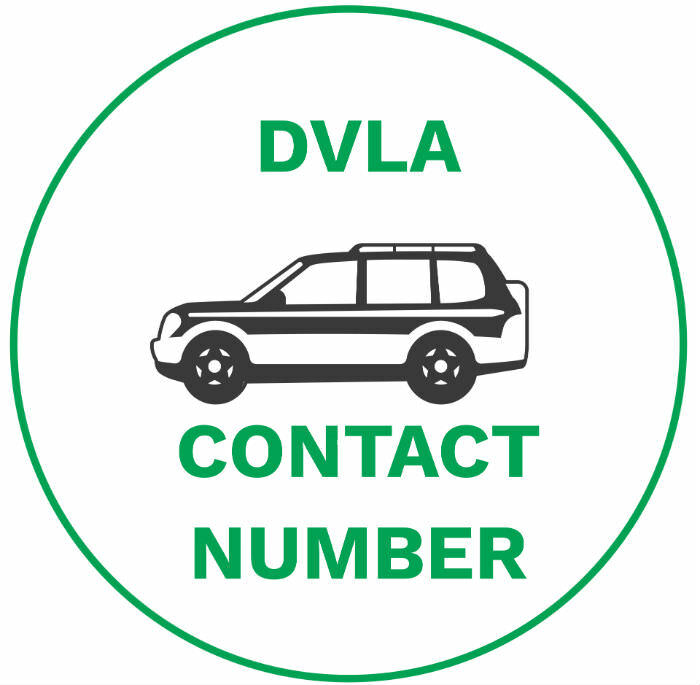 I have a few of them and they are definitely fast becoming a staple diet of my wardrobe. One brand that seem to be doing this quite well at the moment is New Look, who have plenty of in stock online and in store. They recently sent me a lovely grey kimono which I really love. 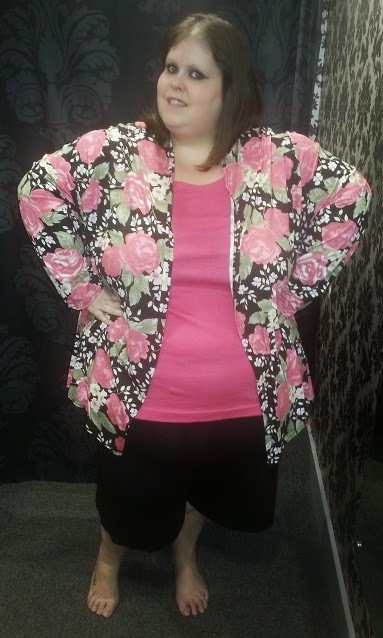 I wanted it because lots of the kimonos around at the moment seem to be big, bold, brightly coloured patterns. Normally I wouldn't be one to shy away from a bit of colour, but when you have a bright coloured pattern dress it is hard to team this with another bright, colour pattern - which is where this grey kimono is so perfect! The grey kimono I have doesn't seem to be on the website any more, but they have loads of nice tops and kimonos from the Inspire range so make sure you check them out! I haven't included outfit pics of this because it isn't available any more but there are so many good alternatives. For Plus North, I wore my trusty Yours Clothing kimono, which has become a firm favourite of mine. I teamed it up with this amazing Topsy Curvy t-shirt, which I have practically lived in since they sent it to me. 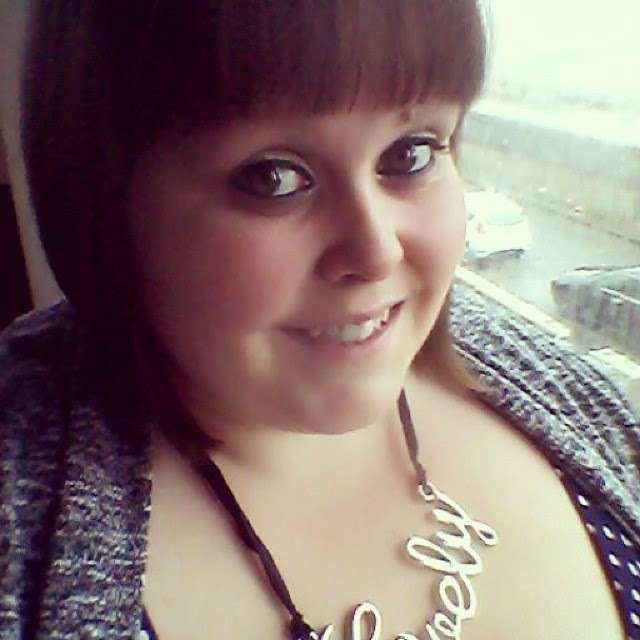 Topsy Curvy are a brand that actually listen to their customers, which for me is amazing! 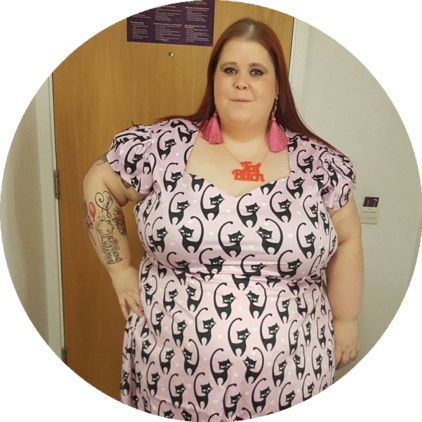 They know that the larger end of plus size is often under-catered for and so are trying to push out new products, including this t shirt which they stock right up to a size 36! 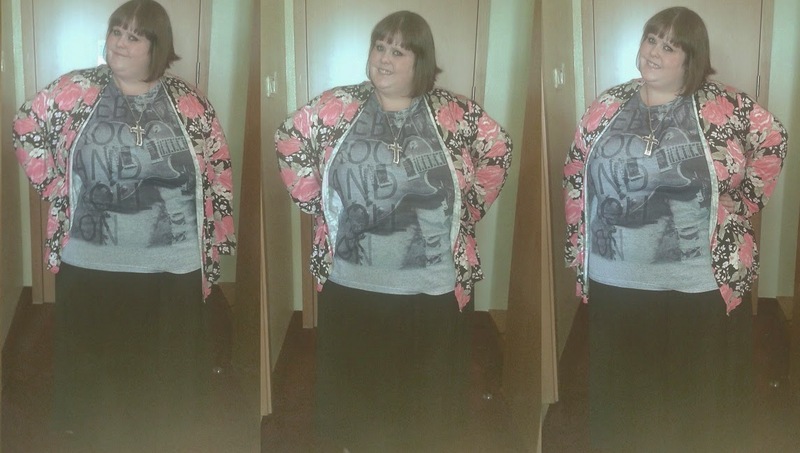 I have also worn this kimono with an amazing maxi dress I got from New Look a few weeks ago and this has fast become one of my favourite outfits. 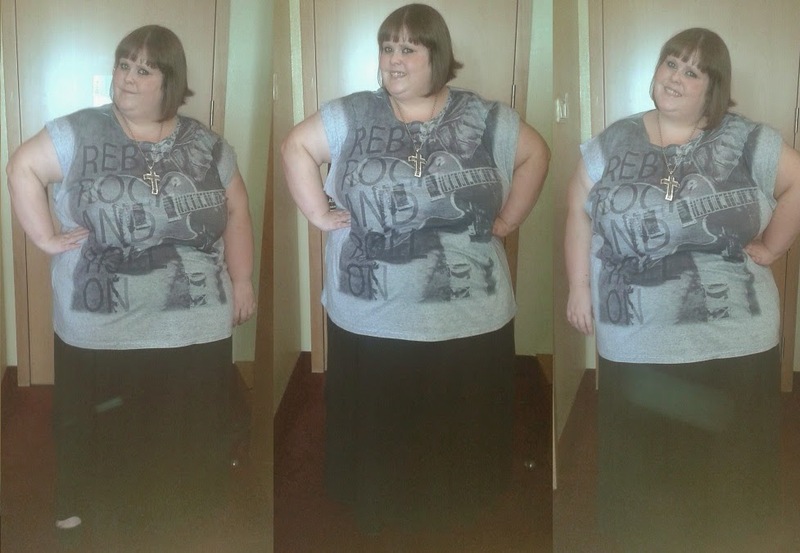 As is so often the case with New Look dresses, I found this maxi dress to be a generous size. One thing I have become more used to recently is mixing and matching brands. Each brand has something different to offer, so matching a plain Topsy Curvy top with a bright Yours Clothing kimono or a plain New Look kimono with a bright ASOS dress is fine! What is your go-to item at the moment? 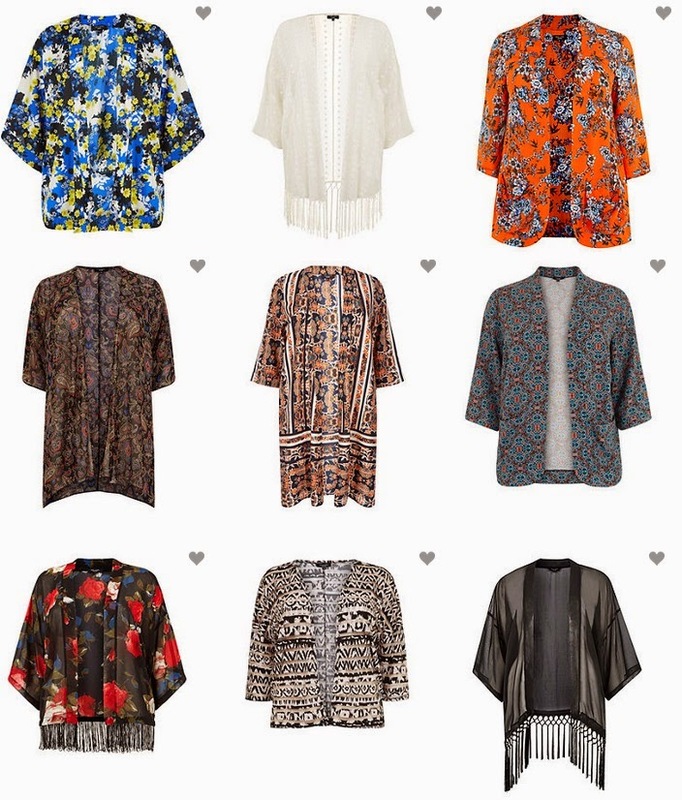 You can barely move this season without seeing kimonos for sale. It's a trend that has taken over plus size fashion, unsurprising when you consider how perfect they are for summer. I am not someone that likes to cover up my arms really so they weren't something that I felt I had to rush out and buy! However last week Yours Clothing offered to let me have one - how could I resist? To be honest with you, I feel sad that I have left it so long to try one! This kimono is so light weight that it's perfect for cooler days. We all know that this weather is so changeable and I am forever being caught out in the rain. One of these in my bag could save a lot of wet dresses! It would also be great for cooler evenings when I am in the pub garden refusing to home until it's completely dark (happens quite often). 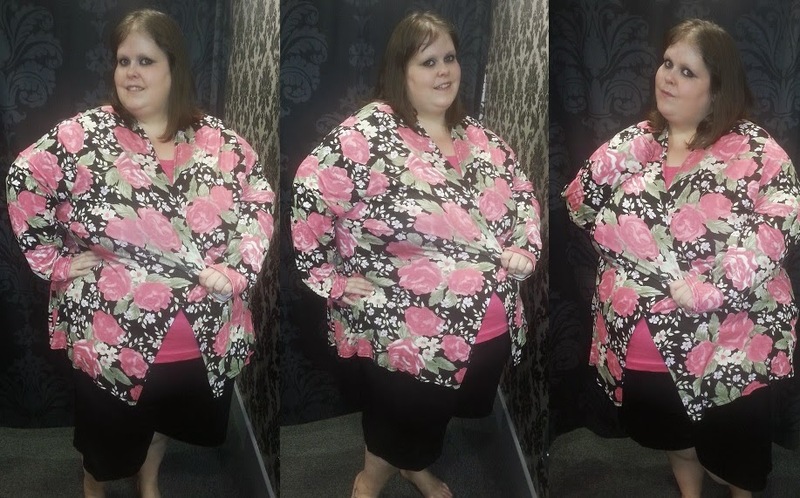 I choose this Pink and Black Floral Rose Print kimono that goes up to a size 32, but I am also quite excited that they do kimonos up to a size 36! You can see that reviewed on Lucia's blog here. Yours Clothing are really leading the way for size 32+ fashion and it's really nice to see! I really love this kimono and I am glad I got it! I can really see me getting quite a lot of wear out of it, especially because I now live by the sea and it's often a bit breezier! It's only £20 on their website (or in store, which is where these pics were taken) so hardly breaks the bank either! Remember If you're new to Yours Clothing you can use my Blogger18 code to get £10 off of a £20 spend. How do you feel about the kimono trend?